There are presented the carved crosses, iconostasises, carved icons and other Church supplies produced by the Art-studio 3D.style. Skillfully executed by way of wood carving the religious objects can acquire a finish view on the customer's choice - covered the special oils with wax, lacquered with different degrees of gloss, patinated, gold plated. From ancient times the Church wood carving adorned all the churches in Russia. Skillfully carving gives not only beauty but also spirituality. All carvings carry deep religious significance. And the floral ornament and the images of birds and animals - all of this are brings a godly message. Wood carving adorned the iconostasis and Church utensils. Carved crucifixion, crosses, icons, vestments for the icons (the icon cases), all of them are created by skilled craftsmen and occupy a worthy place in the art of decorating the Church and home iconostasis. 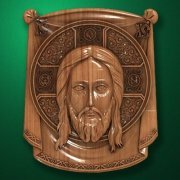 All of the Church carved products are made by deeply believing Orthodox masters under the strict Orthodox canons. If you liked any model of Church products (carved icon, iconostasis, carved cross, kiot for icon, wood-carved cross with crucifix of Jesus Christ, etc. ), but it is necessary to manufacture the carved products on the special individual needs or from other dimensions, different from standard - you can write the request form and describe the specific needs and send to our address. We will discuss options and will contact with you by the specified in the letter way. If you need to make craft products according to your drawings, models or photographs, then also complete the specified request form and send to our email. Please don't forget to attach files that you want to produce the product. Designer group of the Art-studio 3D.style can design any carvings according to the photo or drawing.